Women over 30 may remember Nadia Comaneci, de Surya Bonnali or Marie-Jo Perrec, but they nevertheless lack the mnemonic brilliance of athletes like Michael Jordan, André Agassi and Zinedine Zidane. How is it that female athletes like Amélie Moresmo, Laure Manadou and Serena Williams have not incited followings of such intensity? It's obviously not from lack of talent and skill - these women collect the most coveted trophies. And sometimes more than their male counterparts. However when it comes to image, they are definitely under-appreciated and poorly promoted. Could these days of neglect finally be over? Leading to a reconciliation of femininity, aggressivity, sensitivity and strength in a world full of norms? So often, it is women who are the first to prefer the bodies of ballet dancers to gymnasts and athletes. Muscles, strength and determination do not always reflect the applicable aesthetic models. But with the rise of superwomen like Beyonce in pop culture and Michelle Obama in politics, maybe these requirements are changing, and creating space for body types previously considered "too athletic"? Curves à la Naomi Campbell, Cindy Crawford and Elle McPherson are back to center stage, representing women who stand for power and brilliance, in addition to sexuality. New icons like Beyonce, Rihanna and Nicky Minaj make more heads spin than waify models, providing a positive and healthy example as a result. Parisian women - who as little as 5 years ago would hide their butts under a hoodie tied around their waist if wearing activewear in the streets - now wear bras and leggings outside the studio and performance pieces are part of her essentials. Today, an ideal schedule is constructed around fitness activities that they pick with as much serious and attention as if they were choosing a vacation or workshop. And the goal is to fit in several classes a week (yes, it sounds very poor to our American friends, but it IS a lot for France). The hashtags #yogaeverydamnday or #dynamoeveryday show that physical practices are increasing. But, it's not the only sign: combinations of classes are increasingly sophisticated and efficient, like a cardio class, associated with stretching, and a yoga or pilates class for core strengthening. The emancipation message resonates more than ever and is voiced with increasing impact. Female athletes who arrive center stage through exceptional results allow themselves a moment of pride and appreciation. This summer, Serena Williams dismissed a journalist for referring to her as "one of the best female athletes in the world" rather than simply of "the best athletes in the world". And the tactic worked. By asserting herself in this way, she also became more human and gained our sympathies. Nike then started a campaign dedicated to her: "The best female (crossed out) athlete in the world." 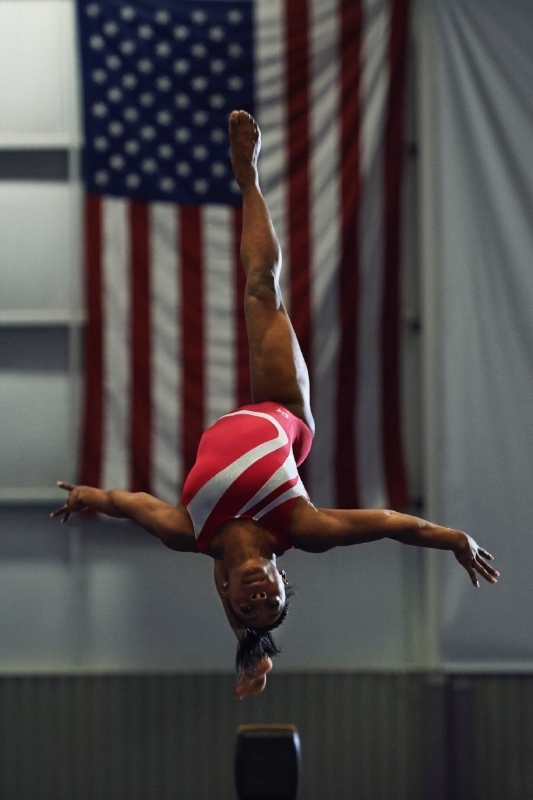 We have been waiting a long time for these moments... And while certain men's magazines continue to publish their sexist "Sexiest Olympics Athletes" lists, Simone Biles took over Rio 2016 at only 19 stating: "I am not the next Usain Bolt or Michael Phelps, I am the first Simone Biles." In the Hurdles video, Emma Watson reminds us that "Women and girls have always faced hurdles, but that’s never stopped us. We’ve sacrificed, fought, campaigned, succeeded, been knocked back, and succeeded again. In a race for justice we’ve leapt over countless obstacles to win our rights. Women didn’t have the right to vote, were excluded from education, were not paid fairly for their work and had no voice in political leadership. Even the first Olympic games didn’t include women. That was then... There are many huge and high hurdles left to jump. The race is still on, every day, of every year of our lives. But we will cross the finishing line. No one can stop us." For this new year we share the template for our Letter to the Universe, an exercise to help us get clear on what we want or don’t want in our lives, and then asking for it by setting intentions. We believe we can all achieve our dreams.